This compelling and engaging listen is a dark tale told in the first person by a Chicago cab driver. He works the overnight shift, so we know he is frequently going to be face to face with some of the city’s most ‘interesting’ characters; he is going to have some very colorful stories. Not all these stories will have happy endings. When Jack Clark’s book was first published in print it garnered some glowing reviews. The Washington Post called it “A gem…just about perfect” and Publishers Weekly described it as “slim, sparse, heartbreaking. We have waited too long for this noir tale to come to audiobook format." The protagonist is cabby Eddie Miles and his life is – of course – complicated. There’s the ex-wife who’s raising his daughter in a faraway city, incommunicado; breaking his heart when he reflects on the loss. Then there’s the woman in the apartment adjacent to his run down flat. She’s connected to him as a part-time, causal ‘romantic’ interest and part-time emotional support. His closest relations are his cohort of after-dark drivers who gather nightly at the back tables of the 24 hour pancake house to swap exaggerated stories, gossip, and news: good and bad. The bad news is that someone has started robbing and shooting cabdrivers, starting with an Indian driver in the suburbs. There is no good news. The distance to the suburbs gives them a rationale to mitigate some of their fear but not for long. Soon, one of the prominent and respected members of their pancake house ‘round table’ is found shot to death in his cab. There is a sub-plot concerning another unknown assailant who is sadistically attacking prostitutes, including some of the working girls Eddie has come to know as he nocturnally prowls the streets. As with every night-time cab in every big city, there is the stream of interactions with the passengers who get in, get where they’re going, and then get out. 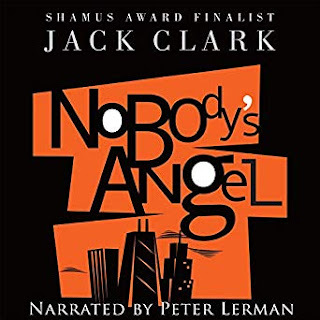 These trips are sometimes uneventful but the ones that aren’t lead to some fascinating tales of some fascinating ridesThe audiobook is an excellent pairing of Clark’s terse writing with Peter Lerman’s authentic sounding rendition of cabdriver Eddie Miles…world-weary and lonely. We see a stark, heartless, urban landscape after dark through Eddie’s eyes and through Lerman’s voice. Sometimes in the reading of such a novel, the urban patois is laid on a little too think; conjuring up images of Al Capone’s Chicago more so than the modern metropolis. Lerman gives us enough gruffness to let us know who Eddie is and give us an idea what he’s been through. We hear a tough guy who still has a conscience and still has a modicum of empathy. Eddie as yet still feels some muted pain for the downtrodden and Lerman communicates this gracefully in his reading. It is an excellent combination of material with narrator, serving both author and reader very well to the great enjoyment of the listener. (Reviewer wishes to remain anonymous. A Shamus Award finalist. LINK.) Slither Sisters HERE.